Let's not use them! Pesticides kill just as many beneficial insects as pests. If you have severe problems use Safer soap just before dark (so that bees and butterflies are not on the plants). Even dishwashing liquids like Ivory liquid or Palmolive, diluted and sprayed using a spray bottle, will kill citrus leaf miners and aphids. The surfactants in the soap suffocate them. Again, do this in the evening every two weeks. If you have roses, and there are aphids on the buds, put on a rubber glove and gently squish them off. I don't know why it is but the sun seems more dazzling these days and my plants scorch in summertime unless they are at least lightly shaded. Quercus agrifolia, California live oak, is the most practical shade tree in California. Although this species has a reputation for slow growth, after the first ten years they take off like rockets and become enormous eventually. If you plant one, choose a tree with all of its lower twigs and branches intact. This will encourage the trunk to grow strong. The lower branches can be trimmed off later on. The grand Valley oak grows even larger, and is deciduous (a winter advantage) but it is susceptible to oak root rot fungus and it is probably unwise to grow this beauty in a city garden. Platanas racemosa, California sycamore is a beautiful deciduous tree with large hand shaped leaves. 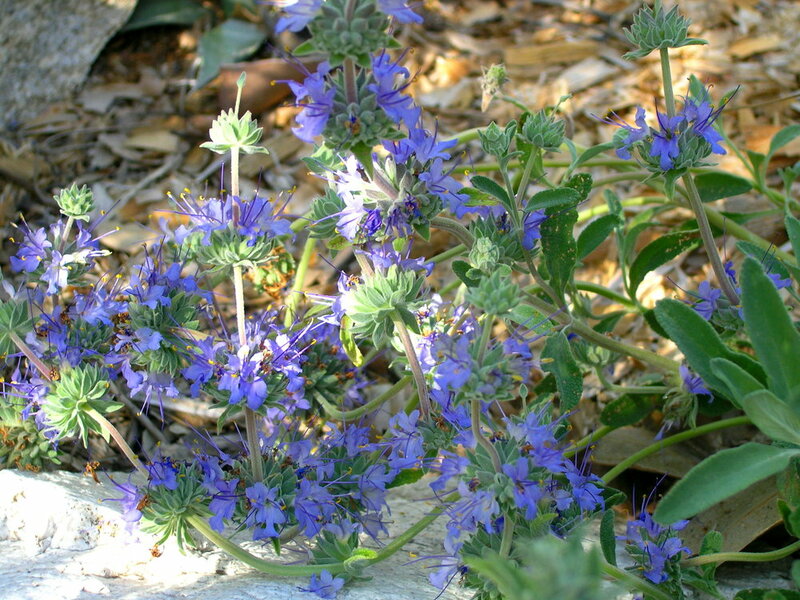 It naturally grows near streams and is not drought tolerant. Grow it if you have a spring or creek. If this tree is stressed by drought it will suffer from blight and drop leaves at any time. The Arizona cultivar is not as susceptible to the blight and you can recognize it because it does not have the characteristic mottled trunk of the California native.